Additive Manufacturing, or 3D Printing as it is most popularly known, is a rapidly evolving technology. Experts believe that it has ushered the 4th Industrial revolution and will prove to be one of the most revolutionary technology ever developed. 3D Printing is not a single process but a set of technologies which operate on similar principles of additive manufacturing. Multiple technologies have emerged over the years such as FDM/FFF, DLP, SLS, Binder Jetting, Rotational 3D printing, Cold Spray AM, and many more. All these technologies offer different solutions for different applications and are currently at various levels of technological developments and acceptance. Laser Source: Laser is the most important equipment used in SLA 3D printer. The laser cures the resin to form hard plastic. 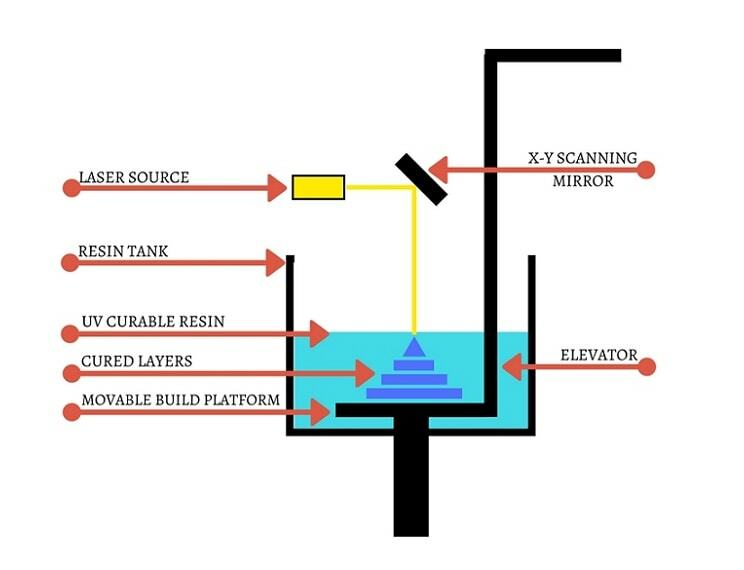 X-Y Scanning Mirror: The Laser beam from the source falls on the X-Y Scanning mirror and this points the beam on the resin and traces the geometry of the design. Resin Tank: This tank holds the photopolymer resin. UV Curable Resin: This is the liquid photopolymer resin which is UV curable, i.e. it hardens on contact with the laser. Build Platform: The layers stick to this movable build platform. This build platform moves in the Z-direction while printing. Elevator: The elevator system controls the movement of the build platform in the Z-direction. 1. Printing/Curing: At the start, the build platform is positioned or dipped in the tank at a distance equal to the height of one layer from the surface of the liquid resin. The UV laser is then activated and falls on the scanning mirror. This mirror directs the laser beam on the resin and it traces the X-Y geometry of the design or the cross-sectional area of the model. The resin is cured and it hardens and the first layer sticks to the build platform. This completes the first layer of the print. Once one layer is printed, the platform is raised and a wiping system sweeps through the bottom of the tank to eliminate bubbles, if any and reduce the chances of a print failure. Next, the build platform drops down by one layer height and the laser again activates and traces the geometry of the next layer. This process continues till the complete model is 3D printed. 2. Cleaning: The completed print is lined with the residual resin from the tank. It is still dripping with the sticky resin. So, the build platform is removed from the elevator system and is rinsed in isopropyl alcohol (IPA) solution to remove the uncured resin. 3. Post-Curing: Post-curing enables the printed parts to attain their full material properties. It is highly recommended for functional parts. After curing, the part functions as per the material properties mentioned by the material manufacturer. 4. Post-Processing: After curing, the support structures can be easily removed and further post-processing like sanding, machining, priming, painting, etc. SLA 3D printing is best suited for aesthetical prototypes with smooth surface finish and minute detailing. The resins are called photopolymers. During the curing process, the monomer carbon chains are activated and become solid creating a strong bond between each other. This ‘photopolymerisation’ process is irreversible and SLA parts cannot be brought back to their liquid form. This is because SLA materials are made from Thermoset polymers as opposed to thermoplastics used in FDM materials.